HVAA is proud to bring back this fall one of our newest soccer programs: HVAA Futures. 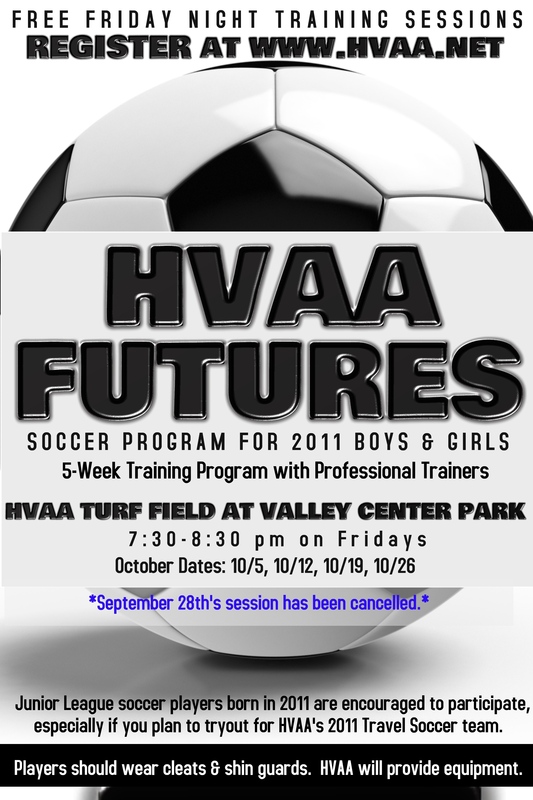 HVAA Futures is a FREE 5-Week Soccer Training Program offered to boys and girls born in 2011. The sessions are led by HVAA’s professional trainers. All HVAA Junior League In-House soccer players born in 2011 are encouraged to participate, especially if you plan on trying out for travel soccer in spring. View this flyer for dates and more details about the program. The first training session starts Friday, October 5th from 7:30 pm to 8:30 pm. The September 28th session has been CANCELLED because of our field conditions from the recent heavy rains. Email soccer@hvaa.net if you have any questions.